We would like to introduce our knowledgeable and caring staff. 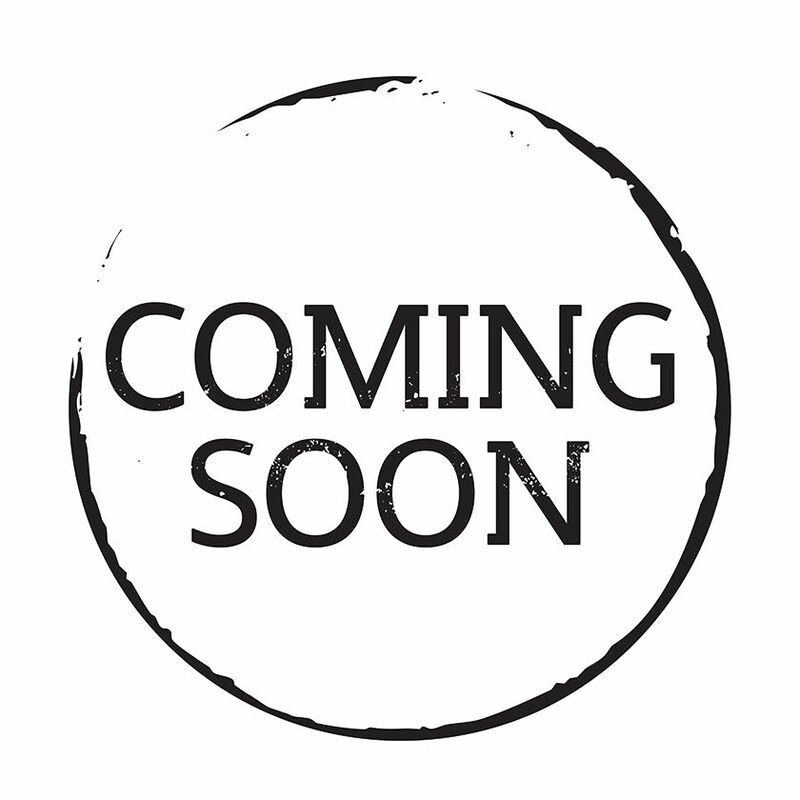 We all hope to get to know you and your pet[s] soon. Of course, we are all pet owners too! Dr. Brad Pope graduated from Colorado State University in 1980. His primary interests are in surgery and preventative health care. 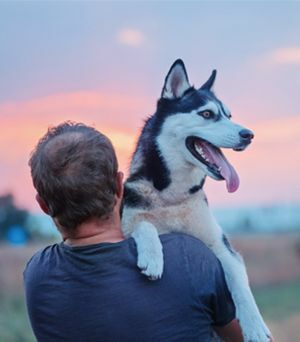 After practicing in Kodiak, Alaska for 8 years he purchased Bayshore Animal Hospital, originally located in the Youngs Bay Plaza. Formerly the Animal Clinic of Warrenton, the hospital had been operating since 1984. In 1994 Bayshore Animal Hospital moved to its current location at 325 SE Marlin Avenue. He designed and built the new 4000 square foot hospital that opened in the fall of 2010. 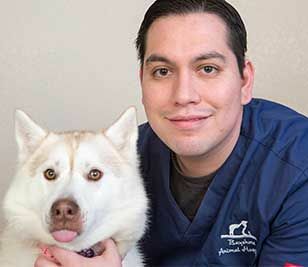 Dr. Pope is a member of the Oregon Veterinary Medical Association, The American Veterinary Medical Association, The OVMA’s Animal Welfare Council, and the American Animal Hospital Association. He has done extensive work for the Wildlife Center of the North Coast, is on the Clatsop County Animal Shelter Administration Committee and the Spay and Neuter Association of Clatsop County. 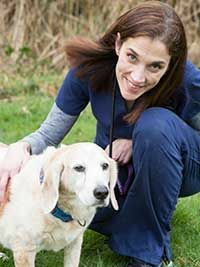 In March of 2002, Dr. Pope was awarded the Oregon Medical Associations Animal Welfare Award. This award is given to an Oregon Veterinarian who has displayed "outstanding professionalism, compassion, and dedication to animal welfare". Dr. Pope lives on a small farm with his wife, two daughters and many animals. In his spare time, he enjoys running and fly fishing. 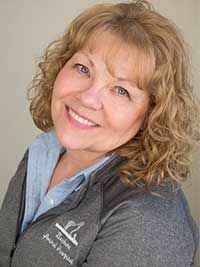 Dr. Sheila Kragerud [Formerly Kilponen] earned her DVM degree from Washington State University’s College of Veterinary Medicine in 2001. In 1998 she completed her Bachelor’s degree from WSU’s Honors College. 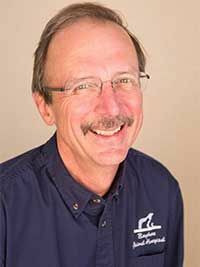 Dr. K is a member of OVMA, AAHA and AVMA and holds a current Oregon State License and USDA accreditation. She also participates on the Clatsop County Animal Shelter Advisory Committee. 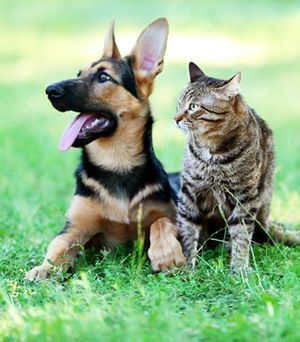 Dr. K joined Bayshore Animal Hospital in 2002 and has since become co-owner in the practice. Her primary areas of interest include internal medicine, soft tissue surgery and dermatology. Coming back to her Finnish roots, she resides back in her hometown of Naselle, Washington and enjoys spending time with her family, camping and cooking. 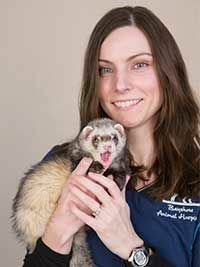 Dr. Prato Matthews received her veterinary degree from University of California, Davis. She is a recent transplant to the Pacific Northwest, joining the Bayshore Animal Hospital team in 2016. 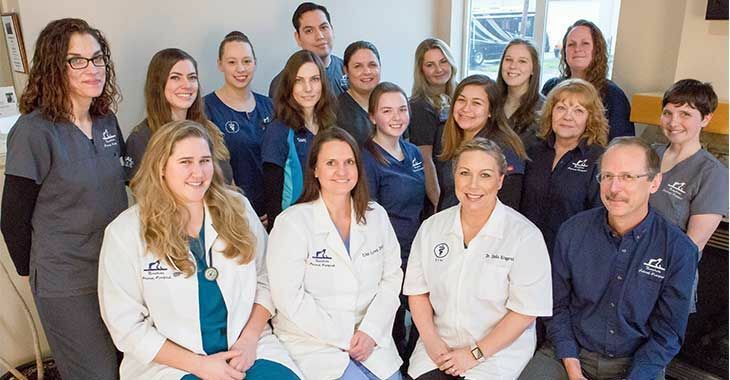 A member of both the Oregon and American Veterinary Medical Associations, her main interests as a general practice veterinarian include preventative healthcare, soft tissue surgery, and internal medicine. She looks forward to working with you to help keep your pets healthy. Tammy is one of our receptionists and comes from extensive animal background. She has raised and bred Thoroughbred horses and has worked in several animal hospitals. Originally from Montana, she has been in the Pacific Northwest since 1993. She shares her home with three feline rescues Weeble, a DSH she rescued from the big December 2007 storm, a Persian named Fungi and an Exotic Shorthair from Russia named Aleks. In her spare time, she enjoys riding with her horse Elvis and creates beautiful handmade jewelry. Kate is our Practice Manager. 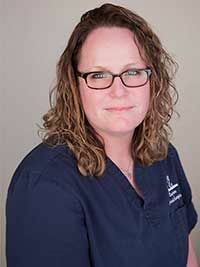 She received her degree from Ohio State in 2004 and recently received a Certificate of Achievement from Colorado State University Veterinary Management Institute in November of 2016. 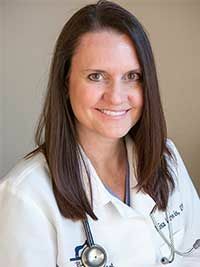 As our Practice Manager her responsibilities include assisting the doctors, managing lab work, employee scheduling, assisting and educating our clients and answering any of their questions or concerns. She has worked in the Veterinary field for fifteen plus years from assisting to Technician role and now in to Management field. In her spare time, she loves to spend time with her husband Anthony and their son Patrick. She shares her home with 4 felines, Chad, Roger, Weasel and Cisco. She also shares her home with her loveable tank of a dog, Sherman and a butterball Beagle, Buster. Jennifer moved to Oregon in 1998 from the sunny island of Oahu. She is one of our receptionists joining the Bayshore team in December of 2009 and has worked in the animal field for over fourteen years in various jobs including kennel management, grooming, pet sitting and assisting veterinarians. In her spare time, she enjoys crafting, cooking and exploring the great outdoors. Living in Seaside with her husband Chad and daughter Savannah, they share their home with a German Shepherd Apollo, 3 feline friends, 2 parrots and a turtle named Fenway. Mary is one of our Certified Veterinary Technicians. 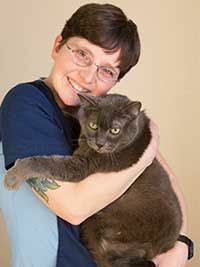 She has been working in the veterinary field for over 20 years and received her CVT license in 1995. She was born outside of Chicago and had lived in California before moving to Oregon in 1994. 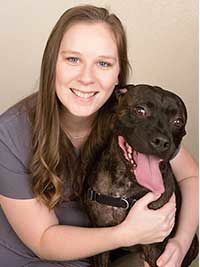 She enjoys working with clients and their pets and has a particular interest in surgery. When outside the workplace she enjoys reading, hiking, and camping along the coast with her dog Pearl. 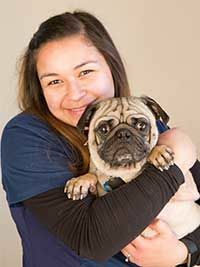 Dany is one of our Veterinary Assistants and graduated from Penn Fosters Veterinary Technician Program. She was raised in the Northwest but moved to Texas for several years. It was there that she got her first job working with animals as a grooming assistant. When not working or studying she enjoys riding quads, riding on her motorcycle, and paintballing. Dany and her husband share their home with three cats: Penelope, Nyssa and Pepe’, a ferret name Captain Morgan and their two dogs Switch and Hugo. 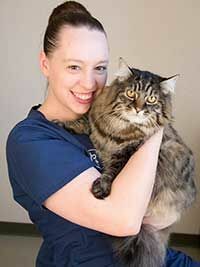 Mandy is one of our veterinary assistants. Originally, she is from Woodinville, Wa and moved to Long Beach, WA in 2005 after earning her Bachelors in Science and Zoology from Washington State University. 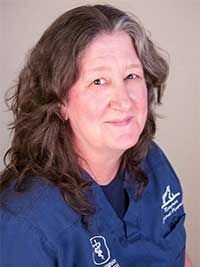 She has worked in veterinary hospitals and boarding facilities since 1998 and completed her internship at Sarvey Wildlife Care Center in 2004. She has volunteered at the Seattle Humane Society as well as WSU Wildlife Society and WSU Raptor Club. From 2006-2013 she was an employee/owner at Long Beach Coffee Roasters and is excited to be working with animals again. She joined Bayshore’s team in 2014 and began studying for her A.S. in Veterinary Technology in August of 2014 and recently graduated December 2017. Mandy lives in Long Beach, Wa with her two children, Evelyn and Roman and shares her home with four cats, Brautigan, Nuki, Gossamer, and Dorian Grey and also a rabbit names Cuddles. When she’s not wrangling kids, working, or studying, she’s going on adventures with her fiancé Rick and his two boys, reading, writing books, riding horses, and spending as much time outdoors as possible. 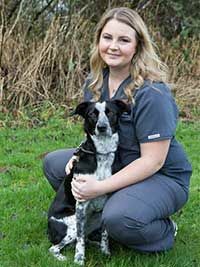 Jillian is one of our Certified Veterinary Technicians after earning her Associates Degree in Veterinary Technology from Broadview University. 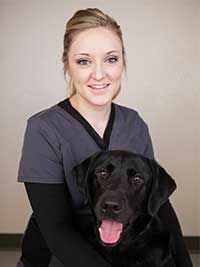 She has been working in the veterinary field since 2013 and joined the Bayshore team in 2015. Jillian moved to the Pacific Northwest and is originally from Utah. On her days off she enjoys exploring, spending time with her pets Tama, Miti and Merle, and volunteering at the Wildlife Center of the North Coast. Alison is a Michigan native who moved to Astoria in 2016 with her husband and three children Scraps, Penny, and Orval (who are actually cats), and has been one of our smiling receptionists ever since. After spending most of her childhood in both dog and horse 4-H clubs, she knew she wanted to continue learning about animal care and medicine. 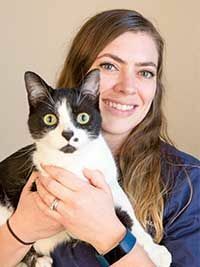 She completed a Veterinary Assistant program and worked as a Veterinary Receptionist in Traverse City, Michigan for the two years that she lived there, and felt she found her calling in helping to facilitate helping animals and also educating their human companions on the importance of veterinary care. In addition to visiting as many beautiful sights in Oregon as they can from their road-tripping van, Alison and her husband Kyle enjoy downhill skiing and snowboarding in the mountains, riding bicycles on the trails, visiting the local breweries, and walking and jogging the Astoria Riverwalk. 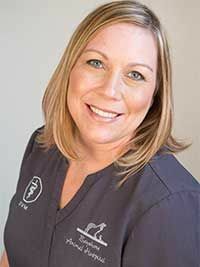 Kim is a Pacific Northwest native, who began working at Bayshore Animal Hospital in January of 2016. To further her career in animal nursing, she is currently enrolled in the Veterinary Technician program through Penn Foster. She shares her passion for animal care with her husband Josh, who is a licensed wildlife rehabilitator, and the executive director of the Wildlife Center of the North Coast. In their free time, they enjoy hitting the gym, hiking with their dog Puffin, or hanging out at home with their cats Sophie and Bandit. Jordan is one of our veterinary assistants/receptionist and joined the Bayshore team August of 2016. Born and raised in Astoria but loves to travel and see new places. In her free time, she enjoys going to the beach, hiking, and painting. 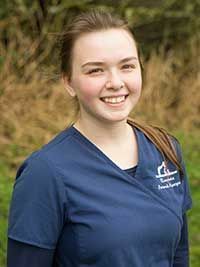 Growing up with dogs and cats, and having had volunteered at the animal shelter, Jordan has a passion for working with animals, and would like to pursue a career in the veterinary technician field. Jordan currently shares her home with her spoiled cat, Toby-Wan Kenobi, and her two gerbils, Bugsi and Popcorn. Hannah has been with our team since September of 2017. She came with a strong background in the medical field with over 9 years working with people but has always dreamed of the chance to become a veterinary assistant. Hannah has shown different breeds of dogs for over 6 years at County Levels and AKC Showmanship. In her spare time, she loves hiking, fishing, snowmobiling, camping, baking, and spending time with her family. Hannah plans to further her career and become a Certified Veterinary Technician in the near future. Jasmine has been born and raised in Astoria. She grew up playing outside and showing large animals at the Clatsop County Fair. Her years showing in 4H taught her she needed to work with animals as a life long career. In those years she showed sheep, pigs, and cattle. She then started her own beef cattle herd which introduced her to the horse world, a true passion of Jasmines. She now has had horses for over 10 years. Her plans are to further her knowledge and career with animals. Jasmine shares her home with 4 dogs; Dally, Diesel, Remington, and Sadie. One newer Christmas addition a feline named Hippopotamus. Two Horses; Miss Bee and Zero Limitations and last but not least a miniature donkey named Moxie. Kelsey is a transplant to the Mainland in 2015 from the warm and sunny Island of Hawaii. Hilo to be exact. This is Kelsey’s first job working with animals and has caught her interest so much she plans to further her career in the Veterinary Field and is currently enrolled in school to become a Certified Veterinary Technician. In her spare time Kelsey enjoys spending her time painting, baking, and soaking up time with her husband Maika. Kelsey currently shares her home with her two pugs Fin and Pepper. Mary Martin moved April 2016 from Washington, DC area and joined the Bayshore team part time in September 2017. She and her husband had been vacationing in the Astoria area for a few years and decided to live where they love. She grew up riding horses and working in equine barns in her home town in the Shenandoah Valley. She has been in the veterinary field since 2004 working various positions from kennel, surgical technician, assistant, and receptionist. In her fulltime job, Mary works with a local dentist as the Insurance Coordinator. With her spare time Mary enjoys hiking, spending time at the beach, and sewing. 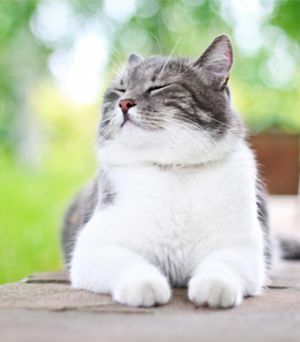 She and her husband currently share their home with their 3 cats – Boris, Stevie, and EmmaLou Who.